As we get to the end of the gardening season, herbs become more precious than ever. By now, many basil plants will have been nipped by frost and what was not harvested for pesto is looking brown and a little gross. The great thing about pesto is that it freezes beautifully, and can be stored in plastic bags that you freeze flat and then store lined up in the freezer. That’s a lot of taste per square inch! What are some other ideas for preserving herbs for the winter? Here are four we really like. While basil makes the absolute best pesto, there are other herbs that can be mashed with garlic, salt, oil and other good things and made into a sauce. One year, I accidentally made something I called “Salty Herbs.” The idea was to try to dry parsley with garlic and lots and lots of salt. Unfortunately, I did not have a dehydrator and was not able to get the herbs or garlic dry enough to bottle. Instead, I took the mixture and added it to a food processor with some olive oil. When it reached pesto-like consistency, I put it in small sandwich bags and froze it. To use it, simply break off one or two quarter sized pieces and add them to cooked vegetables, on top of grilled chicken or into the soup pot. The spread was salty, so a little went a long way. Salad dressings really take on added depth when you use an herbal vinegar. The subtle taste of thyme or dill or tarragon infuses every vegetable in your bowl. Making herbal vinegars is fairly easy and you can find a variety of recipes on the Internet. This blog presents some simple instructions. Essentially, you marinate the herbs (your choice) in the vinegar (your choice) until you have a flavor you like. Vinegars infused with herbs zip to salads and herb-infused syrups add the same zing to beverages. Herb syrups are so easy to make that it’s surprising anyone buys them from the store. To create a syrup, mix together sugar and water and heat it to a boil. The standard ratio is one-to-one (1 cup sugar to 1 cup water) but you can also do a lower sugar amount (1/2 cup sugar to 1 cup water) or a higher amount (2 cups sugar to 1 cup water). It’s all to taste. 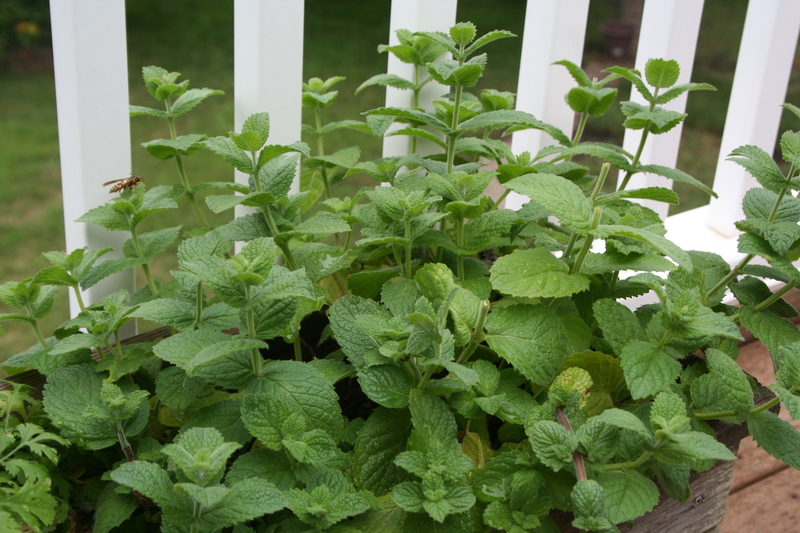 When the syrup boils, toss in fresh herbs — mint is terrific, but I love lemon balm. Basil makes an interesting syrup, too. Let the herbs infuse for at least 20 minutes but you can go much longer, an hour or even overnight. The flavor will increase in intensity. Then bottle and refrigerate. Add it to cocktails or my favorite, a passion iced tea. This recipe from Margaret Roach at Away to Garden is super easy, and you will have herbs for soups and other cooked dishes all year long. You can watch her slide show of how to do it, but essentially it involves picking and washing the herbs, stuffing them into a freezer bag, then compressing them down into an herb log. Tie the log in its bag and put it in the freezer. When you want to sprinkle some herbs into a soup or casserole, just slice off a chunk and add it. What’s your favorite way to preserve herbs for the winter?